Relatives include asparagus, lily-of-the-valley, daylily and hyacinth. Leaves (mostly green) sword-shaped, arching, to 30 inches long and 4 inches wide, on stalks forming clumps. ‘Variegata’ leaves have white stripes. Aspidistra: Greek for small round shields in reference to the shape of the flower’s stigma (female part of flowers where pollen lands and germinates). 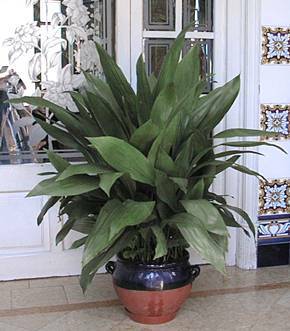 The common name cast-iron plant comes from its ability to withstand difficult growing conditions. It therefore makes a good interior plant. The specific epithet name elatior means taller. Will survive in minimal light, a good choice for that dark corner. Will generally do well in light levels at least bright enough to read a newspaper in comfort but more light would be better.